Imagine a young boy pursuing a lion and snatching it from his jaws and then attacking it and killing it without any fear. He killed both the lion and the bear. Also, when he saw Goliath the giant challenging army, the people and the king, with everyone terrified of him, he presented himself and volunteered to fight him. He told King Saul, "Let no man’s heart fail because of him; your servant will go and fight with this Philistine." (1 S 17: 32) And in fact, David came forward with his sling and horse to fight a giant whose height was six cubits and the staff of whose spear was like a weaver's beam (1 S 17). He told him, "You come to me with a sword, with a spear, and with a javelin. But I come to you in the name of the Lord of hosts, the God of the armies of Israel… This day the Lord will deliver you into my hand, and I will strike you and take your head from you… for the battle is the Lord's". David was strong of heart and faith, so he fought and won. He also showed strength in his nobility. Saul attempted more than once to kill him and pursued him from one wilderness to another, and then finally fell into the hand of David. His followers tried to persuade him to kill him saying, "This is the day of which the Lord said to you, 'Behold, I will deliver your enemy into your hand, that you may do to him as it seems good to you.'" (1 S 24: 4) But David answered, "The Lord forbid that I should do this thing to my master, the Lord's anointed, to stretch out my hand against him, seeing he is the anointed of the Lord." (1 S 24: 6) David's magnanimity caused Saul to weep and to tell him, "You are more righteous than I;". However, he persisted in his perfidy. David was strong in his love. When he was mourning Jonathan he said, "I am distressed for you, my brother Jonathan; You have been very pleasant to me; Your love to me was wonderful; Surpassing the love of women." (2 S 1: 26). And he took care of his children and women. When David sinned, he was very strong in his repentance. He wept profusely in earnest and sincere repentance so that his tears were a drink to him night and day. "I mingled my drink with weeping," and "I drench my couch with tears." He reveals the depth of his repentance in psalm 6 and in Psalm 50. He also says, "O Lord, hear my weeping" and "Put my tears into Your bottle;". David was strong in his repentance and in his spiritual life, in his prayers and in his psalms. He prayed morning and evening and at noon. "Seven times a day I praise You, Because of Your righteous judgments." he says. At night not only he says, "When I remember You on my bed, I meditate on You in the night watches. ", but he also says “My eyes are awake through the night watches, That I may meditate on Your word.” Furthermore, he says, "O God, You are my God,… My soul thirsts for You," "As the deer pants for the water brooks, So pants my soul for You, O God." He was strong in his gentleness and in his patience. It was said of him, "Now the man Moses was a very humble, more than all men who were on the face of the earth." (Nu 12:3). Nevertheless, he was exceedingly strong in standing up to Pharaoh. He was strong as the leader of the people who numbered more than four hundred grumblers and complainers. In spite of this he managed to lead them. He was strong before the Lord, strong in his intercession. When the children of Israel worshipped the golden calf, God was angry with them and told Moses, "I have seen this people, and indeed it is a stiff-necked people! Now therefore, let Me alone, that my wrath may burn hot against them and I may consume them. And I will make of you a great nation.“ But Moses sought the favor of the Lord his god, and said ”Lord, why does Your wrath burn hot against Your people… Turn from Your fierce wrath, and relent from this harm to Your people. Remember Abraham, Isaac, and Israel, Your servants" (Ex 32: 9-12). Moses was as strong in his miracles as he was in his intercession. He was strong in the ten plagues he brought on Pharaoh and his people. He was truly strong when he told his people, "Stand still, and see the salvation of the Lord, which He will accomplish for you today. For the Egyptians whom you see today, you shall see again no more forever. The Lord will fight for you, and you shall hold your peace." (Ex 14: 13,14) He hit the sea with his staff and it divided in two and the people marched in the middle. He also hit the rock and it gave forth water so that the people could drink. He caused manna to fall from heaven to feed them. There were many miracles that God worked through him in the wilderness, just as He worked them in the land of Egypt. The mighty miracles show that he had strong faith and a strong relationship with God. God Himself mentions this relationship, rebuking Aaron and Miriam and telling them, "If there is a prophet among you, I, the Lord, make Myself known to him in a vision; I speak to him in a dream. Not so with My servant Moses; He is faithful in all my house. I speak with him face to face, Even plainly, and not in dark sayings; And he sees the form of the Lord." (Nu 12: 6-8). He was strong in his obedience and in his asceticism. · At the beginning of his call, God said to him, "Get out of your country, From your family And from your father's house, To a land that I will show you. I will make you a great nation; I will bless you." (Gn 12: 1, 2) He left not knowing where he was going (He 11: 8). The strength of his obedience was derived from the strength of his faith and of his asceticism, for he left everything and followed the Lord into the unknown. After waiting patiently many years for God to grant him a son, Isaac, when he was a hundred, God told him, "Abraham… Take now your son, your only son Isaac, whom you love, and go to the land of Moriah, and offer him there as a burnt offering on one of the mountains of which I shall." (Gn 22: 1, 2). Abraham did not hesitate; he did not discuss it, but very early the next morning, he took his son Isaac, and fire and a knife. And there on the mountain the Lord showed him the place. Abraham built an altar there and arranged the wood on it. He laid his son Isaac on the altar on top of the wood and reached out his hand and took the knife to slay his son. What a strong heart this is! And what strong faith, to raise his knife to slay the son for whom he had received the promises. Abraham was just as strong in his generosity as he was in his obedience and faith. Elijah was strong in defending faith, in his holy zeal, and in his standing up to kings. 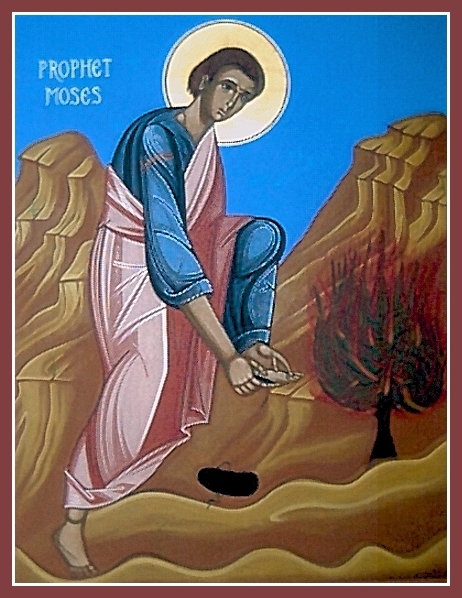 He was so strong that it was said of John the Baptist's birth that he would "go before Him in the spirit and power of Elijah… to make a ready people prepared for the Lord" (Lk 1: 17). In the days of Elijah, there were 850 false prophets of Baal and Asherah whom King Ahab and his wife, Queen Jezebel, protected and who ate at their table. (1 K 18: 19) Elijah went to meet King Ahab who told him, "Is that you, O you troubler of Israel?" Elijah answered, "I have not troubled Israel, but you and your father's house have, in that you have forsaken the commandments of the Lord and have followed the Baals." (1 K 18: 18, 19). Elijah addressed the prophets of Baal with power, "How long will you falter between two opinions? If the Lord is God, follow Him; But if Baal, follow him." He challenged them to offer a sacrifice to their god while he offered one to God so that they could see which one would be consumed by fire from heaven. Through the power of his prayer, fire from heaven descended and consumed his sacrifice. Later, through the power of his prayer rain came down after it had been stopped fro over three years. The rain had been stopped at Elijah's word, "As the Lord God of Israel lives, before whom I stand, there shall not be dew nor rain these years, except at my word." (1 K 17: 1). And indeed there was no rain or dew and there was a famine in the earth. He was strong in understanding and in interpreting dreams. There is no doubt that this was a gift of God and that the Lord was with him. He was strong in his chastity, for he overcame the wiles of Potiphar's wife and because of his chastity, the sinful woman plotted against him so that his master had him thrown into prison. In prison, he gained the confidence of the officer in charge who left the management of all matters to him. The prisoners came to him for advice and it is here that the power to interpret dreams appeared. He interpreted the dreams of the chief baker and of Pharaoh’s cup-bearer and what he told them was fulfilled. Later, Pharaoh was informed of this ability. When he interpreted Pharaoh’s double dream and told him what he had to do, Pharaoh told his men, "Can we find such a man as this, a man in whom is the Spirit of God." (Gn 41: 38). He made him the second man in his kingdom and the overseer of supplies. Joseph was the most powerful Minister of Supplies Egypt ever had throughout its history. With wisdom and authority, he was able to store food during the plentiful years and to distribute this in the lean years. He was able to meet the needs of Egypt and the neighboring countries who came to Egypt in search of grain. Joseph had profound and powerful wisdom in dealings with his brothers. He had the ability to hide his identity from them and showed strength in disciplining them and in revealing the truth about himself. He showed strong emotions towards his father and his brother Benjamin. He was strong in forgiving his brothers who had sold him into slavery. Thus, in the Old Testament, he was able to carry out the Commandment of the Lord Jesus Christ in the New Testament, "Love your enemies,… do good to those who hate you," (Mt 5: 44) He was good to them and their families and did not take his revenge on them. He reassured them and removed their fear of him, especially after the death of his father.